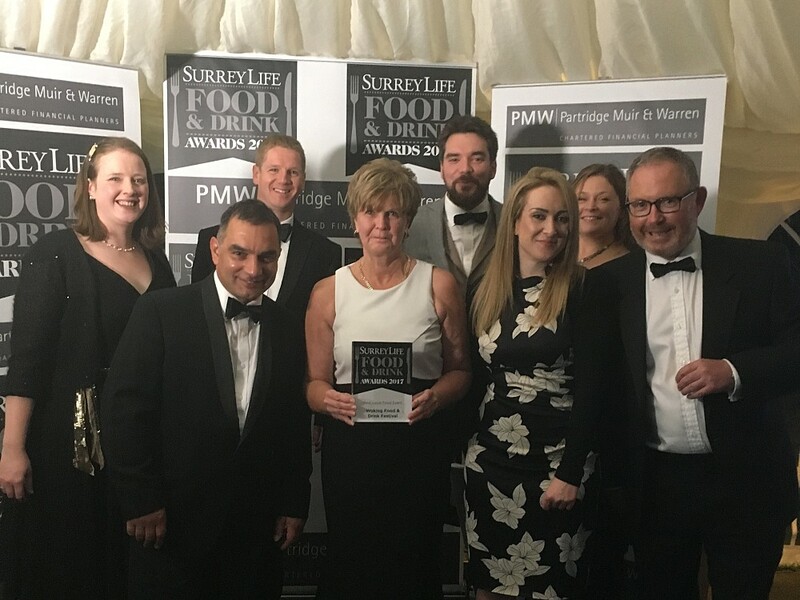 Organisers of the Woking Food and Drink Festival team were once again delighted to win the title of Best Local Food Event for the third year in a row at the annual Surrey Life Food and Drink Awards. At a black tie event hosted at Foxhills Club and Resort on Thursday 21 September, the festival organising team proudly accepted the award, which is voted for by members of the public. On hearing about the award, Cllr Mark Pengelly, Portfolio Holder for Cultural and Community Development, said: “What a fantastic accolade for Woking to score a hat trick with such a prestigious award as the Surrey Life Best Local Food Event Award. Although it is a great honour, it is no surprise to me as I am fully aware how hard the whole team and festival partners have worked over the last five years in order to get the event to the point it is at today. “The event is attracting interest from a much wider audience than it ever did before, with foodies arriving from all over London and the South East to be a part of scene. It is a superb addition to the town’s cultural calendar and another fine reason to be proud of where we live. Woking Food and Drink Festival 2017 was sponsored by Woking Shopping, Tante Marie Culinary Academy, Cellar Wines and Celebrate Woking.